The oldest indications of walls on the Kapuzinerberg Mountain date back to the 13th century. 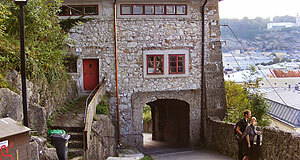 The "Trompeterschlössl" Castle was the base for the Capuchin Church and extended walls down the mountain to the Inneres Steintor in the Steingasse. On the other side, the spread to the Ostertor in the Linzergasse (house number 12), which is not preserved anymore. However, these walls proved to be insufficient for Salzburg during the Thirty Years War and Prince Archbishop Paris Lodron decided to include all of the Kapuzinerberg into Salzburg′s fortifications. Between 1629 and 1632, the Southern side of the mountain was heavily fortified, whereas the Northern side was secured naturally by steep rock walls and cliffs. If you climb the Kapuzinerberg Mountain from the Linzergasse through the Passion Walk described in the article on the Capuchin Abbey, you will pass the Felixtor ("Felix Gate"). It was built in 1632 and Pope John Paul II. stayed here over night once during a papal visit to Salzburg. Passing the Felixtor, you will come to the Capuchin Abbey itself. From here, you can walk for hours - or go straight up to the Franziskischlössl Castle, for example by following the massive walls that hold little towers on the most exposed spots. The Franziskischlössl Castle was heavily fortified in 1629. Today, it is a pub and due to the fantastic view on Salzburg and the surrounding Alpenvorland area you can get there, it is a very popular one.